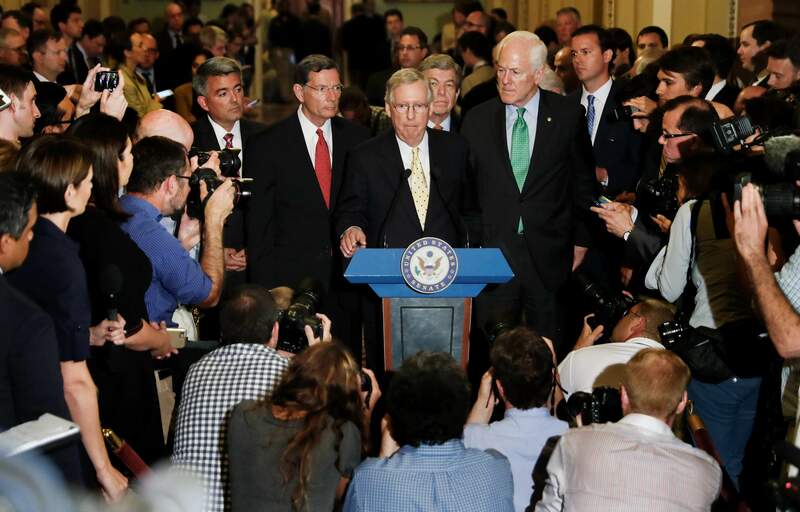 Sen. Cory Gardner, R-Colo., Sen. John Barrasso, R-Wyo., Senate Majority Leader Mitch McConnell of Ky., Sen. Roy Blunt, R-Mo., and Senate Majority Whip Sen. John Cornyn of Texas, speak on Capitol Hill in Washington on Tuesday, July 18. President Donald Trump blasted congressional Democrats and “a few Republicans” over the collapse of the GOP effort to rewrite the Obama health care law. McConnell proposed a vote on a backup plan simply repealing the statute, but that idea was on the brink of rejection, too. DENVER – Gov. John Hickenlooper and the bipartisan group of governors who openly oppose the Better Care Reconciliation Act added their voices to the those calling for a non-partisan approach to addressing the ailing Affordable Care Act. In a statement sent Tuesday, the 11 governors – five Democrats, five Republicans and one Independent– said they are pleased senators are opposing the most recent version of the Senate health care bill, which would have left millions of Americans without coverage. The group asked lawmakers to oppose any repeal and “replace sometime later” efforts. According to the Congressional Budget Office, which provides non-partisan analysis of proposed legislation in Congress, the BCRA would remove coverage for 22 million Americans by 2026. The Colorado Health Institute estimates Colorado would lose $15 billion in Medicaid funding by 2030, and 678,000 Coloradans would lose their coverage if the Senate health care bill were passed as drafted. The governors also reinforced Gov. John Kasich, R-Ohio, and Hickenlooper’s request last month that a bipartisan, public approach should be taken to reform the United States health care coverage system. Colorado Insurance Commissioner Marguerite Salazar, who was appointed by Hickenlooper, said in a statement last week that the instability of the insurance market has been made worse by the turmoil in Washington, D.C., and led companies to request an average premium increase of 27 percent in Colorado. “I believe that the dubious situation at the federal level has contributed to the premium increase requests we’ve seen from the companies,” Salazar said.